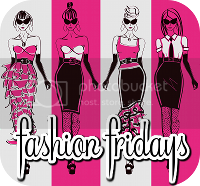 I'm linking up with Kori from Blonde Episodes for Fashion Fridays. 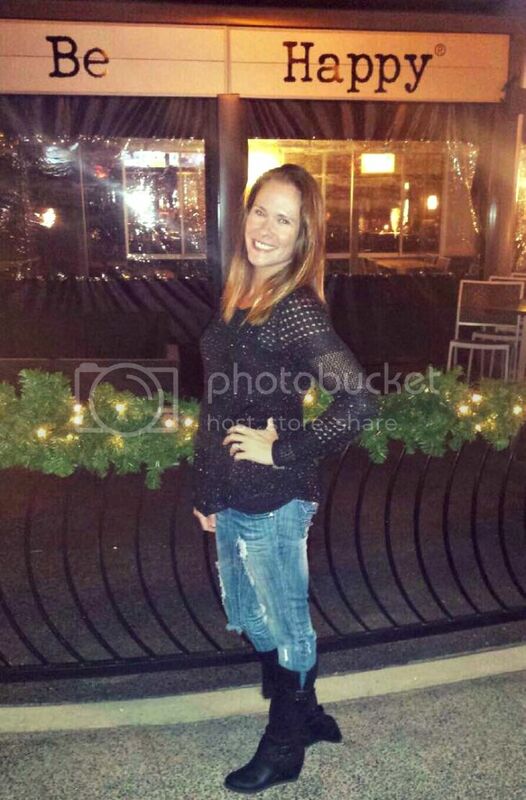 I'm also linking up with Terri from Peace, Love & Applesauce for Friday's Shoegasm. I'm currently loving all things white, navy and red. 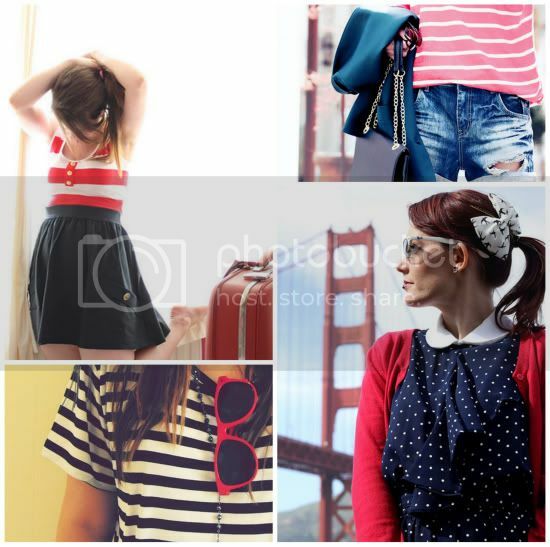 The nautical look is so in right now. I'm loving the clothes, the shoes and the accessories. How cute are these Juicy Couture sea shoes from Zappos? I want them in both colors! 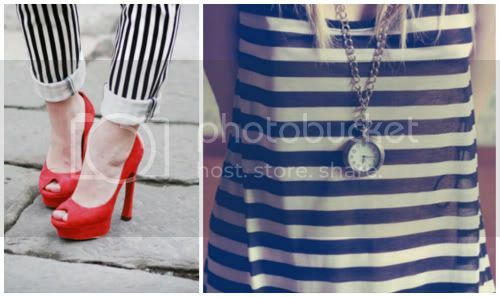 I'm dying to find the perfect red shoe to wear with my white pants + blue/white striped old navy tee.. dying! Target needs to get on that! They are great colors to wear together! Very patriotic :-). It also reminds me of the beach or sailing or something. i love the nautical look! those juicy sandals are too cute! I'm in love with all things nautical!! If only it would warm up here i could break out my red, white and blue stripped everything! I can't decide how I feel about the nautical look on anyone over the age of 6. When I wear something nautical, I feel like I'm trying to relive the 80's. 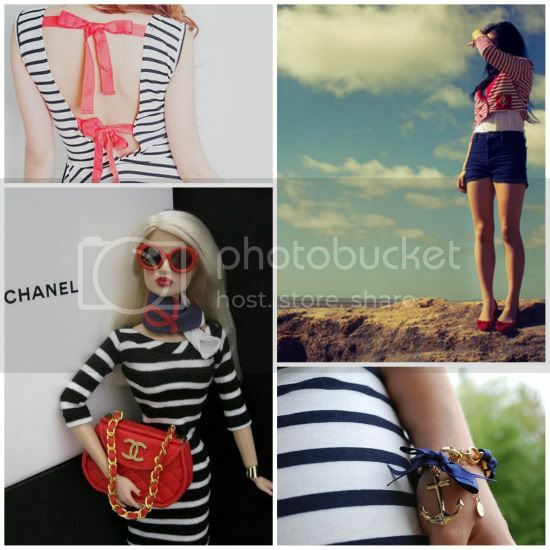 I love the Nautical look, but stripes are not flattering on a nearly-midget girl. So I do the next best thing & put them on my mini-me. The 5 year old looks good in everything. Cute! I love the nautical look. I just bought a pair of blue and white striped espadrilles and some red boat shoes from Old Navy. EVERY year at this time I become obsessed with nautical stuff.. and every year I forego purchasing the striped shirt because I feel like I'm too wide... 2012 is going to be my nautical year, mark my words. I will be to my goal weight and ready to rock those horizontal stripes!! !